\r\nThey don’t make ‘em like they used to: MBW has discovered that ‘new’ albums were outsold by ‘old’ (catalogue) albums online in the US for the first time in 2014. \r\nThe feat of catalogue albums outselling frontline releases was first achieved back in 2012, but that was a momentary blip; it’s never taken place over a whole year before. \r\nThe iTunes/downloads tipping point, as shown by Nielsen stats, is undoubtedly a cute moment, but it also highlights what will be a serious worry for the industry in the future: as you can read/see below, there has been a shocking erosion of sales of ‘new’ albums on physical formats in the past decade. \r\nSuch data asks two very clear questions of record labels: are people merely starting to consume their new music on streaming services rather than buying it in album form? Or are they increasingly less impressed with the new album releases that arrive year-in, year-out? \r\nOne thing looks certain: it now only appears a matter of time – very possibly in 2015 – when catalogue albums outsell new releases across all formats in a single year. \r\nAnnual physical album sales of ‘current’ or new albums fell by a shocking 80% from 2005 to 2014, down from 379.8m to just 77.6m. \r\nInterestingly, the fall in catalogue sales has been more gentle, dropping 67% in the same time period, down from 222.8m to 73m. 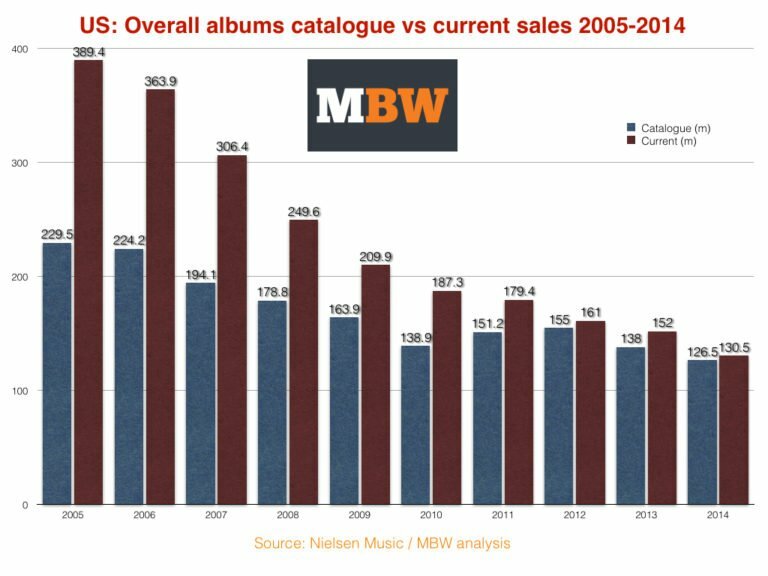 \r\nAs the graph below demonstrates, catalogue album sales on all formats have proven notably more stable than new album sales in the US in the past decade. \r\nAnnual ‘new’ album sales have fallen by a massive 150m since 2005, down to 130.5m in 2014. \r\nMeanwhile, catalogue album sales have dropped by 103m in the same period. \r\nIf the decline in current album sales continues at its current pace, catalogue albums will almost certainly outsell new albums on all formats by 2016, and possibly even in 2015. \r\nIf you want a one-glance indication at how the might of the new album has fallen vs. its catalogue sister product, check out the graph at the bottom – obviously, the space between the two lines represents the dominance of new albums in any given year. Maybe I did not read this right.I probably need some sleep. \r\nWhat are they comparing here. \r\nOld music from a band or artist with their new current release or old artists to new artists. English is not my first language, but they are absolutely comparing sales of old albums vs sales of new albums during this past year. \nI found it interesting because in effect during this year I haven\'t bought any newly released album besides 24K gold, I bought the umpteenth Janis Joplin greatest hits, a David Bowie LP and an old Black Sabbath album but the only other new release I purchased I downloaded it for free. I\'d like to think people are increasingly less impressed with the new album releases that arrive year-in, year-out but rather than admit that they poke their nose in and decide they know what people want in new product (and don\'t) the labels will deflect all blame by claiming it\'s because people are merely starting to consume their new music on streaming services rather than buying it in album form. There may be some truth to this to an extent anyways assuming it\'s younger consumers who would buy the new albums and I doubt they care about a physical product (though I think they should, so they can re-rip etc. if necessary instead of being forced to rebuy an e-copy of something which is clearly where companies want to go anyway, like how you can\'t get CD-R\'s of software anymore because they just want to give you the 3 PC download rule so you have to buy the e-version from them again later). That\'s certainly true but market laws have always been the same, always working this way. \r\nI think it\'s a combination of a new culture of fast-music that quickly lose interest in music products and prefers hit singles instead of the over the quality of a whole album and the musical industry that takes advantage of it in a mutual circle. \r\nI found it interesting because in effect during this year I haven\'t bought any newly released album besides 24K gold, I bought the umpteenth Janis Joplin greatest hits, a David Bowie LP and an old Black Sabbath album but the only other new release I purchased I downloaded it for free. OK I understand.I have not buy any other classic artists or bands myself besides Stevie\'s work.I know it sounds crud for the artists.Most of their work shows up on Youtube or other video sites for free. I wish this single pick feature was available when I was buying albums like hotcakes back in the 1970\'s and 80\'s.It would eliminate all the filler crap tunes.It would be music a la carte .Pick what you went.Eliminate the fluff filler. They don’t make ‘em like they used to: MBW has discovered that ‘new’ albums were outsold by ‘old’ (catalogue) albums online in the US for the first time in 2014. The feat of catalogue albums outselling frontline releases was first achieved back in 2012, but that was a momentary blip; it’s never taken place over a whole year before. The iTunes/downloads tipping point, as shown by Nielsen stats, is undoubtedly a cute moment, but it also highlights what will be a serious worry for the industry in the future: as you can read/see below, there has been a shocking erosion of sales of ‘new’ albums on physical formats in the past decade. Such data asks two very clear questions of record labels: are people merely starting to consume their new music on streaming services rather than buying it in album form? Or are they increasingly less impressed with the new album releases that arrive year-in, year-out? One thing looks certain: it now only appears a matter of time – very possibly in 2015 – when catalogue albums outsell new releases across all formats in a single year. 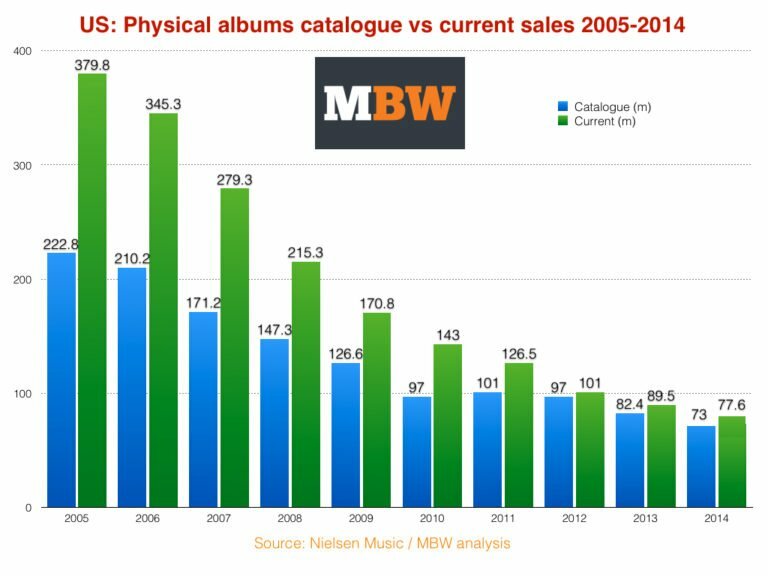 Annual physical album sales of ‘current’ or new albums fell by a shocking 80% from 2005 to 2014, down from 379.8m to just 77.6m. Interestingly, the fall in catalogue sales has been more gentle, dropping 67% in the same time period, down from 222.8m to 73m. 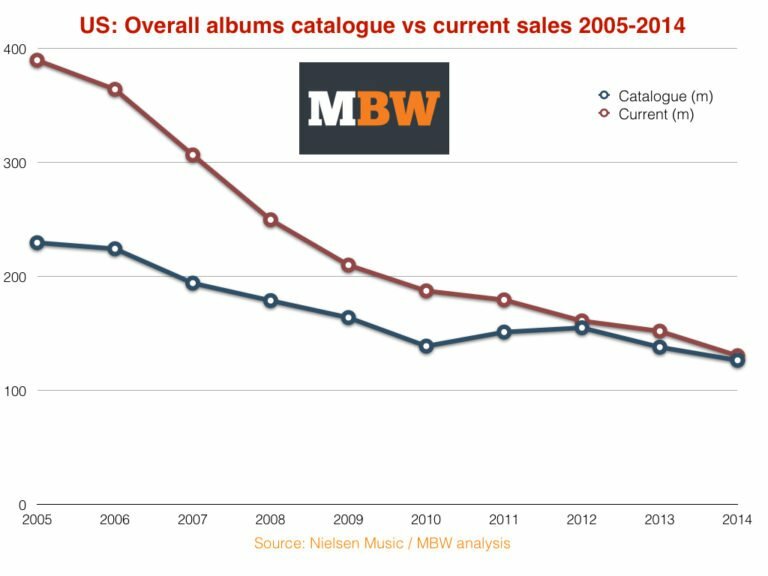 As the graph below demonstrates, catalogue album sales on all formats have proven notably more stable than new album sales in the US in the past decade. Annual ‘new’ album sales have fallen by a massive 150m since 2005, down to 130.5m in 2014. Meanwhile, catalogue album sales have dropped by 103m in the same period. 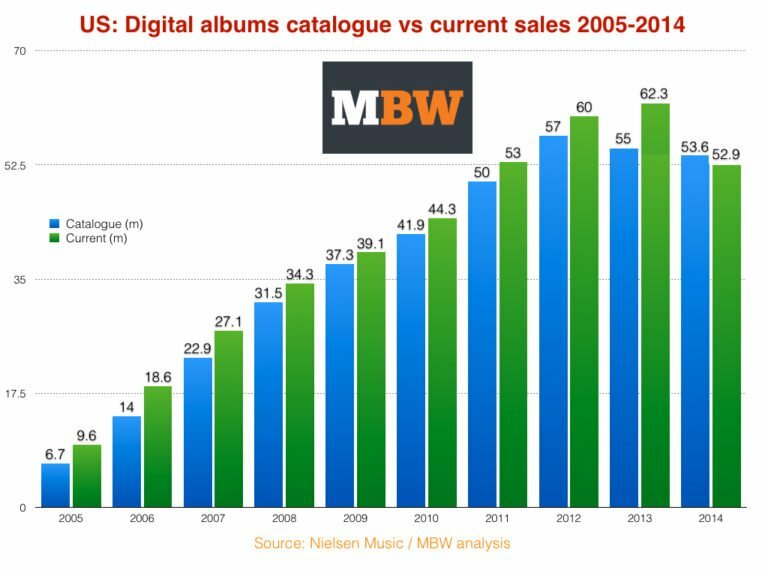 If the decline in current album sales continues at its current pace, catalogue albums will almost certainly outsell new albums on all formats by 2016, and possibly even in 2015. If you want a one-glance indication at how the might of the new album has fallen vs. its catalogue sister product, check out the graph at the bottom – obviously, the space between the two lines represents the dominance of new albums in any given year.